Our mostly grey west-coast winters tend to have little in the way of colour – so instead, we learn to appreciate the subtle textures and monochromatic hues that dominate this season. The sandstone shoreline in the photo above is typical of Gabriola Island. The soft rock has been eroded over the ages by salt water, wind and waves rolling in from the wide and often windy Strait of Georgia. As a result, long, shelving pans appear as the tide goes out – gently undulating sandstone that calls out to be walked upon. But beware: in winter these shores are slippery with algae, so they can be treacherous. Much more treacherous, though, would be the huge increase in the number of massive crude oil tankers moving through the Strait if Kinder Morgan gets its pipeline expansion plan approved. It would make a major oil spill here an eventual certainty – with our shores, beaches and the intertidal life they support directly on the receiving end. Most of us on the west coast take for granted the ability to enjoy beautiful, life-affirming shorelines, year-round. But clearly, we shouldn’t. The good news is that public awareness is growing, and many people are starting to add their voices to the growing campaign to say “no” to more tankers passing through our waters. In the meantime, I’ll remind myself to notice and appreciate, more than ever, the beauty contained in the soft rock, subtle textures and gentle hues of our island’s shores – even on the greyest day that winter can bring. If you’d like to learn more about the tanker issue here in our region or how you can help, here’s a link. 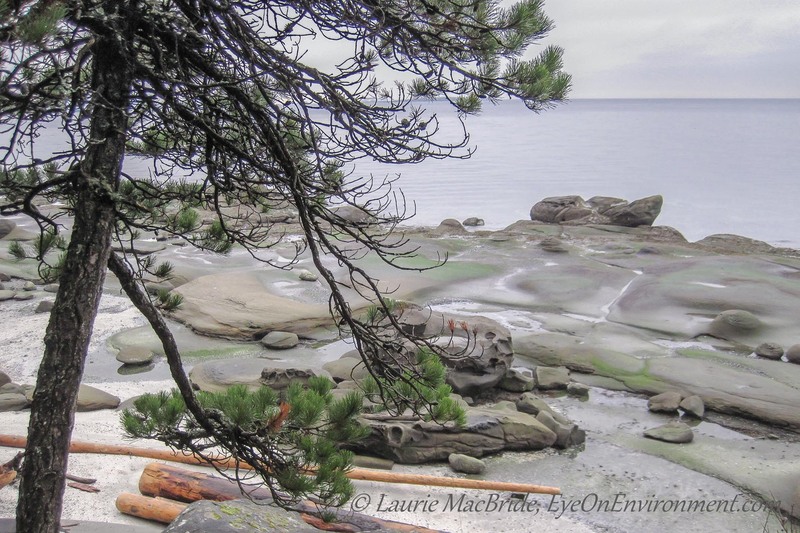 Posted by Laurie MacBride, Eye on Environment on January 23, 2014 in BC coast, Environmental issues, Gulf Islands, South Coast & Vancouver Island and tagged beaches, erosion, Gabriola, geology, oil, sandstone, shoreline, tankers, winter. Great shot and great message here, Laurie, as you know we are dead set against the shipping of oil from any of BC’s ports, it’s just too risky! Love your photograph here, very very west coast!!! Thanks Toad. I agree wholeheartedly – we need to be leaving most of this oil in the ground if we’re to have a chance to keep the earth livable. Tomorrow I have to start work on my application to participate in the NEB hearing for the Kinder Morgan proposal (deadline is coming up fast). Would much rather be out taking photos though! This is an absolutely glorious image Laurie of a very special place. You have so beautifully captured the subtle tones you describe. Thank you for making us more aware of the danger this area is in. Thanks for your kind words, Sherry! I hope you’ll keep your fingers crossed that we can defeat this dangerous proposal. You captured the shoreline so beautifully, Laurie. I do hope it stays that way. Thanks, Robin – we share that hope. I suspect that you may be as torn as I feel about the shipping of crude from BC. If there must be crude shipped from Canada’s west coast, then this is the better place to do so – the waters are less dangerous, there are better facilities for cleanup management, more tugs, work boats, and other necessary resources, a pretty heavily degraded environment and many more anchorages and millions of people. The latter part keeps the pressure on to make sure things are done well, and since we constitute most of the votes in the province governments will pay attention. Not to mention that we burn an awful lot of petroleum products around the margins of the Salish Sea. And Kinder Morgan has a much better safety record than Enbridge, though neither of them operates or is responsible for the ships that carry the oil once it reaches the coast. The north coast option is considerably worse – it would be the longest escorted confined channel waterway in the world, with ships transiting over the course of 24 or 28 hours (when will the skipper sleep? how many pilots do you need? what about on the tugs? etc). There are only two anchorages suitable for tankers, one that will hold one of these ships and the other capable of holding 2 or 3 – that is along a 135 km route. Hecate Strait is a nasty bit of water and some of the world’s largest waves (up to 105 feet) have been recorded there several times in the past decade or two since measurements began and they come singly among waves otherwise peaking around 40 feet [which is bad enough], and thus are unpredictable, Douglas Channel has seen several land slides that generate tsunami over the past few thousand years, including an underwater collapse of the Kitimat River delta a few decades ago that caused a tsunami that destroyed docks and other facilities in Kitimat. There is very little infrastructure for pilotage, guiding ships, navigation, cleanup, and so on, a much more complex, intricate, exposed and thus difficult shoreline to clean up, much of it is a pristine environment, there are nearly no residents, nearly no voters and it is quite a bit out of sight and out of mind for most voters and politicians. On balance there are more reasons not to ship from the north coast than from the south coast. But I live within a couple of hundred metres of the southern coastline, and it is my back yard… And, I have worked a lot along the shorelines of the north coast and Haida Gwaii. I would hate to see an oil spill in either place. However, if what seems pretty much inevitable, that oil will be shipped from the BC coast, I would reluctantly go for the southern option for the reasons listed above. I hope this does not come to pass. You really caught something special there Laurie! Visiting from Kim Manley Ort’s class. Wonderful blog. Thanks for visiting, Diana, and I’m glad you like it!